Oh my gosh, y'all -- I just returned from a fabulous trip to London, the Cotswolds, and Paris! C'est magnifique! NOTE: My high school French didn't really come in handy. Since the only line I remember in French is "Come on, quit fighting all the time," I was kinda at a loss, unless my friends were quibbling about the cost of dinner, natch. NOTE to NOTE: Of course, I'm only slightly better off in German. My lines there are "Do you have a light?" and "Why didn't you come before the stairs burned?" Obviously, my career as an arsonist in Germany awaits. Luckily, things in Paris have changed since my friend Priscilla and I basically hosteled through Europe in the mid 1980's. While I remember the French people hating us and our big ugly American ways back then, now they seem to be super friendly and all speak English. NOTE: I do realize that our $600-a-night hotel and the $100 dinners might have something to do with this recent vacay change -- yes, I do know I paid the French people to be nice to me. And I'd do it again. Anyway, after a couple of weeks away, I'm really glad to be home and back at Community Partners of Dallas. NOTE: Even though our auditor is here. One of the things we did in Paris was on Memorial Day we went to the Suresnes American Cemetery. The cemetery has about 2,000 American dead from WWI and 24 unknown soldiers from WWII. 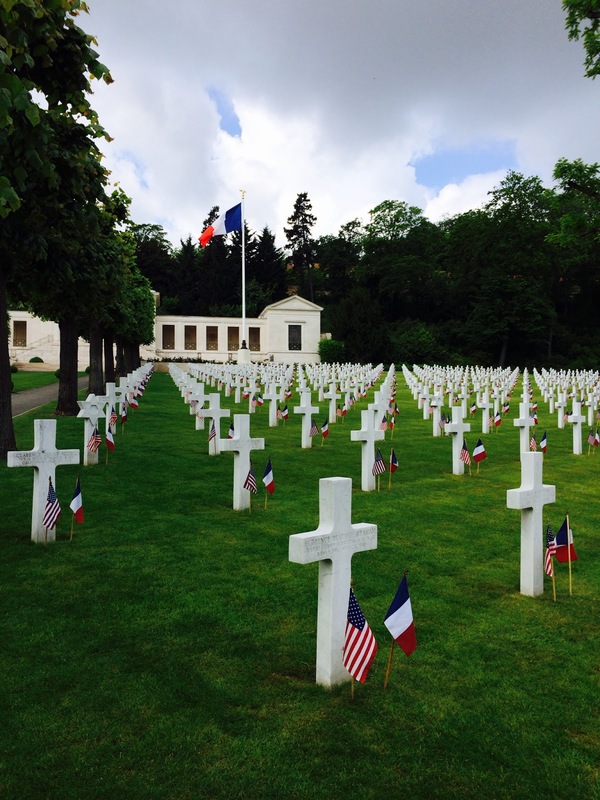 It was truly moving to be there and to see all of the American and French flags on each grave. We are so lucky to live in America. And I'm so lucky we speak English here. OMG! It sounds like a fabulous trip! NOTE: Wanna hear all the details!! Glad you're back... Missed you. PS.. Love the Patricia/Caitlin remark. You are the sweetest, Katie! The Caitlin photos make me want only one thing: Annie Leibowitz as my photographer!